IN my previous article, I shared the impact of high credit card interest rate that many have overlooked and hence, overspent. Interestingly, there are loans outside the confines of financial institutions that affect the mass. These loans are largely unregulated and therefore, more painful in terms of financial burden and emotional stress when the loan and interest cannot be repaid on time. Every now and then, I will receive text messages from unknown contacts offering loans at “attractive” rates. A check with my close associates indicates that I am not alone in receiving such messages. These messages and those stickers offering loans on the streets share the same traits, i.e. easy loan with no pre-qualification required. Example – “Borrow RM1,000, and return RM200 monthly for six months”. At first glance, it seems like the interest rate for the loan is 20%. However, as the repayment period is only six months, it is actually 40% per annum! This rate is 11 times higher compared with the average fixed deposit rate of 3.5% per annum in the market. 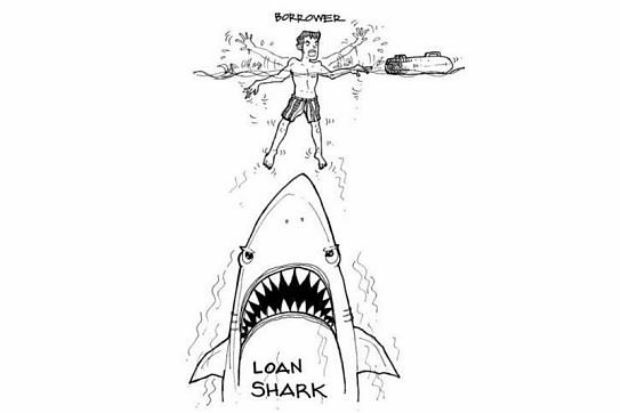 These loans are offered mostly by unlicensed moneylenders, otherwise commonly known as “loan sharks”. According to a news article published in The Star recently, the interest they charged are mostly counted based on monthly or even daily rest basis. It is learnt from the article that people usually borrow between RM1,000 and RM10,000 at an interest rate of 0.5% to 1% per day. This works up to about 15% to 30% monthly. When the loan is defaulted, another 5% is added as a late repayment penalty. It therefore becomes evident that the borrowers of such loans face immense problem repaying their loans. They will generally end up borrowing from other moneylender to cover their existing loan which will lead them to more debts. Imagine the emotional stress from harassment when they are unable to serve the interest. Sadly, this loan with its easy application process and low requirement attracts people who are financially desperate, regardless of professional or income group. Bank Negara has announced that Malaysia’s household debt-to-gross domestic product (GDP) ratio has increased from 86.8% to 89.1% as of 2015. We have one of the highest household debts in the region without including the unregulated loans from these “moneylenders”. I wonder how this “shadow banking” or “off balance sheet transaction” impact our people and economy. To protect the rakyat, the government should look at strengthening the enforcement of eliminating illegal money lending. As the saying goes “where there is demand, there is supply”. Hence the key is to first understand why people resort to borrowing from these “moneylenders”. It is important to strengthen financial education and awareness of public through various channels. People, especially children, should be taught to borrow for the right things from young, and understand the difference between good debt and bad debt. More importantly, people should learn to ask themselves if there is a real need to borrow. Borrowing money to buy assets that depreciate over a short period of time, such as cars and luxury items is deemed as “bad debt”. This is in stark contrast to “good debt”, such as buying a home or asset that has the possibility of appreciating in the long term, and at the same time, paying a much lower interest rate compared with bad debts. For people with a genuine need for financing, there are many other options such as borrowing from the banks and legal money lenders, or even to the explore “fintech”, a financial technology which offers more efficient and cheaper financial services through the use of technology. Again, it is important to ensure these channels are legal and well regulated. Borrowing from unregulated moneylenders is like jumping from the frying pan into the fire. It is important to have wise financial planning in the first place and always seek advice before doing anything financially. One may get advice from government agencies, such as Agensi Kaunseling dan Pengurusan Kredit, when faced with financial challenges.